Gameful learning is a take on instructional design that incorporates many of the best motivators of games and play. It applies the powerful psychological factors of play to influence student motivation, provides choice in how to accomplish learning goals, and changes the fundamental way students are assessed. These changes don’t make easy play out of scholarly work; rather, they give students a new focus while accomplishing that work. A gameful course is often fundamentally different in its grading structure. Traditional courses tend to start with an assumed ‘A’ that can dip or dive depending on a student’s success from week to week. With grade maintenance their primary goal, students are less likely to take a chance and risk a short-term failure. But risk-taking is often necessary in learning. Gameful courses, on the other hand, start students at zero and they work up from there, making every gradable object a move in the right direction. This approach allows students the room to take chances along the way and to extend themselves, as they are given multiple chances to prove their competence rather than relying on sustaining a fluctuating grade as their goal. Gameful learning often creates a greater sense of ownership for students as they make choices and take chances on their path through the course. Instructors curate selections for students, who may, for example, choose several small formative quizzes to master concepts, or opt for a harder challenge quiz to skip smaller units and move ahead. These choices can allow students to move forward until they reach material that requires more effort, keeping them engaged and, in many cases, highly motivated. The biggest reward for students, in the long run, is a greater sense of purpose in their course work. Recasting the focus from busywork and fluctuating grades throughout the semester, gameful learning applies another layer of purpose by encouraging students to reach the next level of achievement, constantly moving toward an ultimate goal of demonstrated competence. Further reading can be done by visiting the University of Michigan’s Gameful Pedagogy site. Mango Languages is a language-learning software which teaches practical conversation and valuable cultural insight for new languages. Using an encouraging, conversational style, Mango offers 70+ languages, including many which are less commonly taught such as Haitian Creole, Cherokee, Punjabi and Thai. Mango Languages is available free to all ND faculty, staff and students. Now it’s your turn: If you’re a faculty member who uses Mango and has found it valuable for your teaching or your research, we would love to hear from you and include your story in an future edition of this newsletter. Questions can be directed to the Center the Study of Languages & Cultures via email at cslcstaf@nd.edu, phone 574.631.5881 or visit the CSLC at 329 DeBartolo Hall. Thinking about creating your own multimedia to provide students with new and improved content? It’s a worthy undertaking, but there are smart ways of approaching this and ways that can lead to inefficiencies and frustrations. 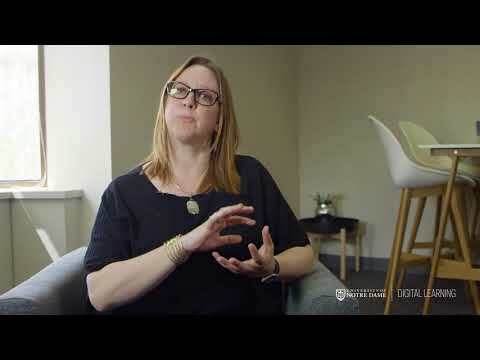 If you’re game for the former and not keen on the the latter, take some time to think through the suggestions made by Laurie Kirkner, director of the Office of Digital Learning, in the following video. The Moreau First Year Experience (FYE) program was created in 2015 to give students a smooth transition from high school to college life at Notre Dame. All incoming freshmen, placed in small groups across 115 individual sections, cover important topics that range from cultural competency and well-being to healthy relationships and academic success. Because it was new, program creators and course designers wanted to keep an eye on the course to make sure the content was meaningful, so that students would engage with it and not just survive their first weeks of college, but flourish. Moreau course materials are delivered through Sakai and give students a visually attractive layout with an organized workflow, providing every class section the same experience. They are structured around weekly topics which include essays and videos presented as a flipped-classroom experience. Students study the weekly material, then write and submit reflections prior to the in-class discussion, enabling them to discuss the topic on a deeper level. Creating a sweeping course with the breadth of topics it covers took the work of many people. “One of the really groundbreaking things about Moreau is that it’s a very active partnership between the academic unit of First Year of Studies and the Division of Student Affairs,” explains Maureen Dawson, assistant dean in the First Year of Studies and FYE co-director. Dawson, along with Paul Manrique, program director for New Student Engagement and FYE co-director, worked with instructional designers and learning data scientists to curate and build the FYE course sites in Sakai. The FYS course creators collaborated with the Kaneb Center for Teaching and Learning to make the course sites not only an effective learning tool for students, but also a predictive tool for student success. Instructional designer Kevin Abbott and Alex Ambrose, Kaneb’s digital learning analyst, built the Sakai sites to output data based on student activity that answers questions about how students actually engage with the content. As the course has matured, designers now understand their data is not only valuable in tweaking the course for greater student engagement, but that it can also be used to recognize if a student is falling behind, and that a student’s struggles with the Moreau course could be indicative of larger struggles in their first year. According to Kevin Barry, director of the Kaneb Center for Teaching and Learning and member of the original Moreau design team, it was this emphasis on developing the capacity to assist students within the first three to five weeks that has made the program so special. 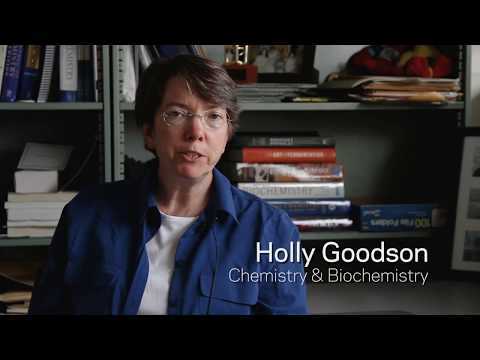 Professor Holly Goodson had been teaching large sections of chemistry and biochemistry at Notre Dame for several years. She’d struggled with communicating with so large a number of students. “One of the most challenging aspects of teaching a large class is figuring out how to make personal connections with the students,” says Goodson. She found that frequent collaboration and communication with large classes and multiple groups couldn’t always be handled in Sakai and definitely couldn’t be controlled with email alone. Coordinating meeting times, project drafts, and answering hundreds of student questions would quickly overwhelm an instructor or TA. Then Holly heard about Piazza from a colleague. Designed originally as an anonymous forum tool, Piazza now handles most of the communication needs for Holly and her TAs, giving everyone an established way to communicate between multiple instructors, students and student groups, no matter the scale. Most important to Goodson was Piazza’s integration with Sakai. As a third party tool created and managed outside of Sakai, Goodson initially began using it independent of Notre Dame’s learning management system. Her many students needed to set up independent accounts, resulting in problems when students didn’t remember their logins or had multiple accounts from semester to semester, making them hard to keep track of. Then Holly worked with Sakai administrator Laura Gekeler, who helped her integrate the Piazza app with Sakai so that users have quick access using their Notre Dame credentials. “Now it’s just like anything else in Sakai, so there’s link to the Gradebook, there’s a link to the Resources, and there’s a link to Piazza. It’s seamless,” says Goodson.